Lucian Wintrich was arrested after grabbing a woman who grabbed his notes of a lecturn during a speech at the University of Connecticut. He was charged with misdemeanor breach of peace, which the state agreed to drop at his arraignment. He spoke with his attorney Norman Pattis outside court. Charges have been dropped against a conservative commentator who grabbed a woman after she took a copy of his speech at the University of Connecticut titled "It's OK To Be White." The woman who took the papers has now been charged instead. Lucian Wintrich was arrested after grabbing the woman and charged with misdemeanor breach of peace. Wintrich is the White House correspondent for the right-wing blog Gateway Pundit. He was at UConn on Nov. 28 to give the speech, which drew protesters. Cellphone videos show the woman taking paperwork off the lectern Wintrich was using and walking away. Wintrich then goes after her and grabs her before being led away by police. Wintrich's attorney Norman Pattis said the prosecution agreed to drop the charges when Wintrich appeared for arraignment at Rockville Superior Court Monday. Pattis maintains that his client was the victim of the incident and that the case is an issue of freedom of speech. "Free speech matters. It’s OK to be white, black, brown or anything in between. My client came to Connecticut and was treated like a criminal for no reason," Pattis said. Wintrich said that he felt that justice was served and that he was pleased that "the system corrected itself." "We don’t want to set a precedent where people can walk up to speeches they find disagreeable and, ah, steal them. I mean that’s really not what America’s about," Wintrich said. The woman who took the papers, who has been identified as 33-year-old Catherine Gregory, was charged Monday with criminal attempt to commit larceny and disorderly conduct. 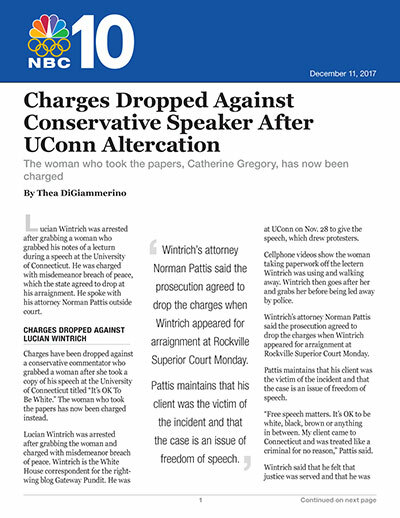 Wintrich and Pattis have threatened legal action against her and criticized UConn for the incident. "What happened at UConn the other night what shameful and they will be hearing more from us in the not too distant future," Pattis said. Gregory’s attorney, Jon Schoenhorn, has defended his client’s actions. Schoenhorn previously told NBC Connecticut his client was motivated by the desire to stop what he described as “hateful, racist statements” that Wintrich was making during the speech. "He's going to suggest that picking up a piece of paper deserves a lawsuit whereas his violent reaction and threats — nevermind the fact that he physically assaulted Ms. Gregory — would be what, understandable under the circumstances? But his provocations would not," Schoenhorn said. Gregory is due in court on Wednesday. She works as a college adviser at Quinebaug Valley Community. QVCC released a statement after the incident saying that Gregory attended the event as a private citizen and that it does not condone the behavior and encourages peaceful discourse and compassionate debate. UConn issued new guidelines for speakers and campus events in response to the incident.